Pepper exhibits genetic diversity and versatility in use. Knowledge of the genetic control of traits in peppers is of great importance to breeding programs given the variety of types, sizes, colors and flavors. The aim of the present study was to examine the inheritance of seedling and plant traits in ornamental pepper (Capsicum annuum). The experiment was conducted in a greenhouse in the plant biotechnology section of the Agricultural Sciences Center, Federal University of Paraíba. Seven ornamental pepper accessions (Capsicum annuum L.) belonging to CCA-UFPB's Germplasm Bank were used: UFPB001, UFPB004, UFPB77.3, UFPB099, UFPB134, UFPB137 and UFPB390. Morphoagronomic characterization was performed based on Capsicum descriptors (IPGRI, 1995), and twelve quantitative traits were evaluated regarding seedling and plant. The data were previously subjected to variance analysis and subsequent diallel analysis performed according to Hayman's (1954) method. The t statistic was used to test the adequacy of the additive-dominance model. Seedling height, hypocotyl diameter, cotyledon leaf length, plant height, first fork height, leaf length and width and chlorophyll a and b represent traits that conformed to the additive-dominant model. Genetic gains in regard to plant traits (plant height, first fork height, crown diameter and leaf length and width) in ornamental peppers are possible using breeding programs. Partial dominance of all plant traits is noted, and overdominance of the traits seedling height and cotyledon leaf length and width were observed. The parents UFPB001 and UFPB134 exhibited the highest concentration of favorable alleles for size traits and are indicated for selection for continued improvement programs. The pepper belongs to the Solanaceae family and the genus Capsicum. The species C. annuum originates from Central and South America. Its use has spread to numerous countries, and pepper is used for different purposes (Pickersgill, 1997; Collera-Zúniga et al., 2005; Li et al., 2007). In addition to food (Bosland and Votava, 1999; Carvalho et al., 2006), pepper is included in the formulation of pharmaceutical and cosmetic products (Yamamoto and Nawata, 2005) and is also used ornamentally (Rêgo et al., 2016). Ornamental use is based on the fact that it has several interesting traits, such as smaller plants, leaf density, leaf color, flowers and fruits color and various fruit shapes (Carvalho et al., 2006; Stommel and Bosland 2006; Rêgo et al., 2016). In addition to these aspects, pepper plants are easy to grow. As they are perennials, peppers are suitable for growing in pots (Neitzke et al., 2010). The demand for pepper plants is growing in Brazil, especially because their cultivation is of great social importance, as it involves a great deal of family farming labor (Nascimento et al., 2006; Finger et al., 2012). Although some ornamental pepper cultivars are currently on the market for production, such as Calypso, Pirâmide and Espaquetinho, there is a need for studies that seek to obtain new varieties. This requires the study of inheritance of traits of interest from an ornamental point of view. Knowledge in regard to the genetic control of a trait is of great importance to breeding programs and allows the most appropriate procedure to be chosen for use in selection and breeding methods (Cruz et al., 2012). Several genetic designs are available in this regard, particularly diallel crossing (Cardoso et al., 2015). Hayman's (1954a) method is based on knowledge of the environment and genetic nature expressed in terms of means, variances and covariances obtained from a diallel table. This method provides information on the inheritance mechanisms of the traits under study, the genetic values of their parents and selection limits (Viana et al., 1999). In Hayman's method, homozygous parents are crossed two by two to obtain F1 plants, which give rise to the next generation (F2) and so on (Baldissera et al., 2014). Within this context, this study's objective was to study the inheritance of ornamental pepper (Capsicum annuum L.) seedling and plant traits. This study was conducted in a greenhouse at the Plant Biotechnology Laboratory, Agricultural Sciences Center, Federal University of Paraíba (CCA-UFPB) in the State of Paraiba, Brazil. Seven ornamental pepper accessions (Capsicum annuum L.) belonging to CCA-UFPB's Germplasm Bank were used: UFPB001, UFPB004, UFPB77.3, UFPB099, UFPB134, UFPB137 and UFPB390. These accessions exhibit diverse qualitative traits (Table 1). BD - Branch Density; LC - Leaf Color; CC - Corolla Color; ASF - Anthocyanin Spot In The Fruit; IFC - Intermediate Fruit Color; RFC - Ripe Fruit Color. Table 1: Description of six qualitative traits of the seven ornamental pepper accessions Capsicum annuum L.) used in this study CCA-UFPB. The crossings were manually performed in floral buds in pre-anthesis. The plants were emasculated in the morning and immediately pollinated by introducing the pollen from the anther of a plant to the stigma of the receiving flower of another plant. Then, plants were labeled and covered with aluminum foil to prevent contamination (Nascimento et al. 2012a). When the fruit was ripe, it was collected, and the seeds were subsequently removed. The seeds of the 42 hybrids and seven accessions were sown in polystyrene trays of 128 cells filled with a commercial substrate (Plantmax®). When the plants produced six definitive leaves, they were transplanted to plastic pots containing 900 ml of the same substrate after 40 days. Morphoagronomic characterization was performed based on Capsicum descriptors (IPGRI, 1995). Eleven quantitative traits relating to seedling and plant were evaluated. The evaluated seedling traits were as follows: seedling height (SH), cotyledon leaf length (CLL) and cotyledon leaf width (CLW). The plant traits evaluated included plant height (PH), stem diameter (StD), first bifurcation height (FBH), canopy width (CW), leaf length (LL) and leaf width (LW). Two physiological traits, chlorophyll a (CLA), and chlorophyll b (CLB), were also evaluated. A digital caliper (Lee Tools® Digital Caliper) was used to collect data on dimensions. Scales (Bel engineering®) were used to obtain data relating to weight. Quantitative values were obtained by counting. The chlorophyll content in the leaf was measured using a digital chlorophyll meter (ClorofiLOG - Falker). The experimental design was fully randomized with 49 treatments and eight replications, comprising one plant per pot and consisting of 42 hybrids and seven parents. Detection of variation was achieved by applying an analysis of variance using the F test at 1% probability. To use the method described by Hayman (1954a) and modified by Viana et al. (1999), it was necessary to test whether the seedling size and traits met the following assumptions: Mendelian inheritance and homozygous parents, absence of reciprocal effect, epistatic interactions and multiple alleles. Furthermore, the genes had to be randomly distributed across the country. As a whole, possible flaws in the assumptions were determined by an adequacy test for the additive-dominant model as follows. The Wi and Vi values were used to test data, fitting the additive-dominant model as follows: a) the Wi - Vi variation was evaluated by analysis of variance, testing the occurrence of differences in values of this expression between the crossed matrix lines; b) Linear regression analysis of Wi in Vi, testing the significance of the angular coefficient of the straight line (H0: b=1 vs Ha: b ≠ 1); c) Wi and Vi weighting by 45° rotation of the axes represented by these statistics, and the angular coefficient of the straight line was tested after rotation (H0: b=0 vs. Ha: b ≠ 0) with the new values of Wi and Vi. After verifying the adaptation of the data to the additive-dominant model, the analysis of variance interpretation and statistics obtained from the diallel table were used to estimate the genetic and environmental components: E, environmental variance effects; D, the additive effects of the genes; H1, H2 and h2 effects due to dominance; F, covariance effect between additive and non-additive effects; and D - H1, component that expresses the difference between additive and dominant gene effects. The meaning of the different variation components was verified by the t-test by dividing the estimates according to their respective standard deviations. Genetic variation component estimates were divided by standard deviations and the significance determined by the t test, considering values greater than 1.96 with a significant probability of 5% (Singh and Chaudhary, 1979). The following genetic parameters were also estimated: √H1/D, mean degree of dominance; H2 /4H1, distance between alleles; dominant/recessive relationship; number of dominant genes; restricted coefficient of determination; broad coefficient of determination; correlation between mean parent values ( ) and of the sum of covariance between the parent means and means of the r-th row ( ); variance between the means of the r-th row ( ); expected values of the coordinates , and , ; and predicted value for the parent with maximum concentration of dominant ( ) and recessive ( ) alleles. The significance of the components and parameters is explained by Hayman (1954b). All analyses were performed using the Genes computer program (Cruz, 2013). A significant treatment effect (parents and hybrids) was observed at a 1% level of probability for all evaluated traits (Table 2). The coefficients of variation (CV) ranged from 7.736% for the canopy diameter to 44.497% for cotyledonary leaf length (Table 2). For the height of the seedlings, the average values observed were 3.767 cm. The plant characteristics, the average values observed were 20.334 cm for plant height, 8.535 cm for the first fork height and 27.144 cm for the canopy width. These characteristics are important for ornamental studies of pepper (Table 2). SH - Seedling Height; CLL - Cotyledon Leaf Length; CLW - Cotyledon Leaf Width; PH - Plant Height; Std - Stem Diameter; FFH - First Fork Height; CW - Canopy Width; LL - Leaf Length; LW - Leaf Width; CLA - Chlorophyll A; CLB - Chlorophyll b. ** Significant at the 1% level of probability, according to F test. CV - coefficient of variation. cm (centimeters). Table 2: Analysis of variance and mean squares estimates of plant and seedling traits in ornamental pepper (Capsicum annuum L.) CCA-UFPB. The additive-dominant model adequacy test for the traits seedling height, cotyledonary leaf length, plant height, first fork height, leaf length and width and chlorophyll a and b showed no significant values in the regression coefficients, indicating the adequacy of this model for these traits (Table 3). After logarithmic transformation of the data, the additive-dominant model proved adequate for cotyledonary leaf width, stem Table 2: Analysis of variance and mean squares estimates of plant and seedling traits in ornamental pepper (Capsicum annuum L.) CCA-UFPB. diameter and canopy width. The model was partially adequate, making the additive dominant model sufficient (Table 3). SH - Seedling Height; CLL - Cotyledon Leaf Length; CLW - Cotyledon Leaf Width; PH - Plant Height; Std - Stem Diameter; FFH - First Fork Height; CW - Canopy Width; LL - Leaf Length; LW - Leaf Width; CLA - Chlorophyll A; CLB - Chlorophyll b.Ns - Not Significant; * and ** significant at the 5 and 1% level of probability of error, respectively. ns not significant; * and ** significant at the 5 and 1% level of probability, respectively, according to t test with 5 degrees of freedom. The correlations of and were positive for seedling height (0.470) and hypocotyl diameter (0.885). Cotyledonary leaf length and width showed negative values of -0.088 and -0.669, respectively (Table 4). SH - Seedling Height; CLL - Cotyledon Leaf Length; CLW - Cotyledon Leaf Width. Table 4: Estimated parameters in diallel using Hayman's method (1954) for seedling traits in ornamental pepper (Capsicum annuum L.). CCA-UFPB. The selection limits for seedling height were 3.182 in the most recessive accession and 7.369 in the dominant accession (Table 4). Among the studied accessions, UFPB134 exhibited the greatest concentration of recessive alleles (Table 4 and Figure 1a) by presenting equal to 1.178, which represents the value closest to the estimate. The UFPB004 parent had the highest concentration of recessive alleles for cotyledonary leaf length and width, with values equal to 0.929 and 0.148, respectively. These results indicate the possibility of obtaining strains with greater cotyledonary leaf length and width. Selection limits regarding these traits were 2.012 for cotyledon leaf length and 0.858 for cotyledonary leaf width in the most recessive genotype (Table 4 and Figures 1b and 1c). 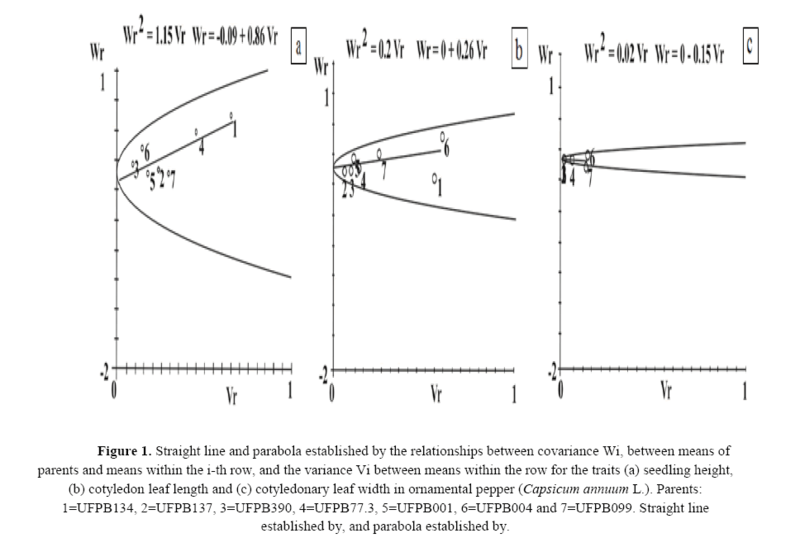 Figure 1: Straight line and parabola established by the relationships between covariance Wi, between means of parents and means within the i-th row, and the variance Vi between means within the row for the traits (a) seedling height, (b) cotyledon leaf length and (c) cotyledonary leaf width in ornamental pepper (Capsicum annuum L.). Parents: 1=UFPB134, 2=UFPB137, 3=UFPB390, 4=UFPB77.3, 5=UFPB001, 6=UFPB004 and 7=UFPB099. Straight line established by, and parabola established by. The r correlations (and) were positive for the following traits: plant height, stem diameter, first fork height, crown diameter, leaf length and chlorophyll b, with values ranging from 0.094 to 0.965 (Table 5). Leaf width and chlorophyll a exhibited negative r correlation values. For the traits plant height, first bifurcartion height and canopy width, recessive alleles had the highest concentrations, with positive values of 0.965, 0.888 and 0.655, respectively (Table 5). Among the studied parents, UFPB77.3 had the highest mean and concentration of recessive alleles, contributing to the increases in these traits with a value of 42.878 for plant height, 15.616 for first fork height and 16.049 for canopy width (Table 5 and Figure 2a, 2b, 2c and 2d, respectively). In contrast, UFPB001 and UFPB004 parents exhibited the highest numbers of dominant alleles for the traits plant height and first fork height, whereas UFPB001 and UFPB134 parents had the highest figures for canopy width (Table 5). 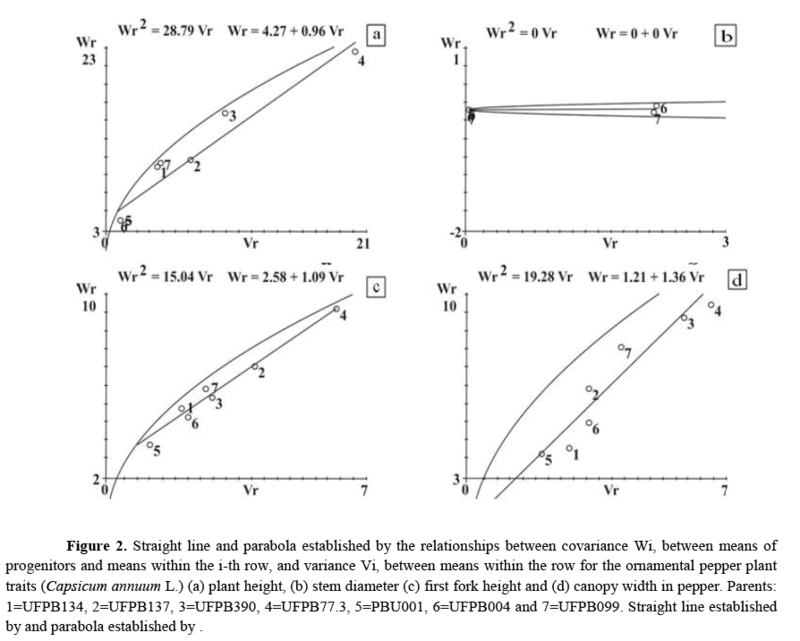 Figure 2: Straight line and parabola established by the relationships between covariance Wi, between means of progenitors and means within the i-th row, and variance Vi, between means within the row for the ornamental pepper plant traits (Capsicum annuum L.) (a) plant height, (b) stem diameter (c) first fork height and (d) canopy width in pepper. Parents: 1=UFPB134, 2=UFPB137, 3=UFPB390, 4=UFPB77.3, 5=PBU001, 6=UFPB004 and 7=UFPB099. Straight line established by and parabola established by . The r correlations (and) of 0.094 indicate that the recessive alleles were responsible for the increased stem diameter. The values of and were 0.003 and 415.583, respectively (Table 5). The parents with the greatest recessive homozygous stem diameter were UFPB004 (2241) and UFPB099 (2.242) (Table 5 and Figure 2b). The selection limit for this trait was 3.414 in the most recessive parent and 0.003 in the most dominant parent. The r correlation value for leaf length ( and ) was 0.180 (Table 5). The greatest values of ( ) for recessive alleles were found in the UFPB001 parent (0.614), which was closest to the expected value of 1.061 (Table 5 and Figure 3a). The parent UFPB77.3 (0.181) had the highest concentration of dominant alleles for this trait with the recessive alleles contributing to the increase in this trait. 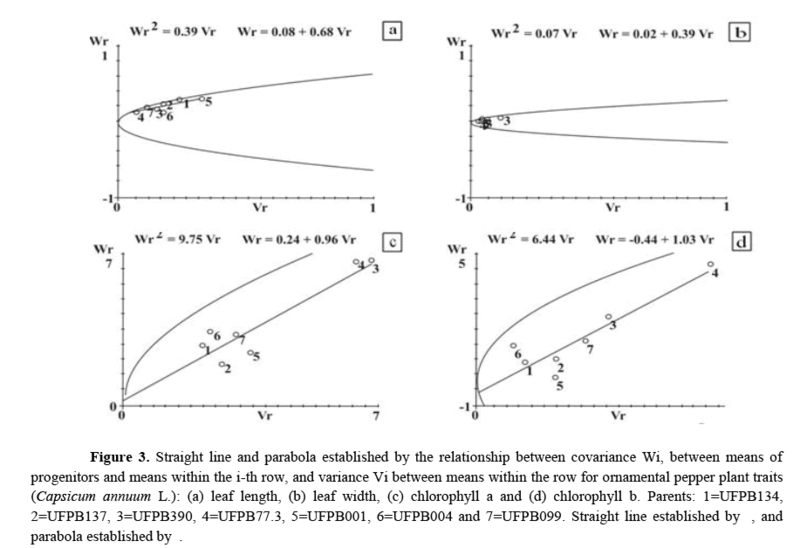 Figure 3: Straight line and parabola established by the relationship between covariance Wi, between means of progenitors and means within the i-th row, and variance Vi between means within the row for ornamental pepper plant traits (Capsicum annuum L.): (a) leaf length, (b) leaf width, (c) chlorophyll a and (d) chlorophyll b. Parents: 1=UFPB134, 2=UFPB137, 3=UFPB390, 4=UFPB77.3, 5=UFPB001, 6=UFPB004 and 7=UFPB099. Straight line established by , and parabola established by . The selection limit for leaf length was 6.972 in the most recessive accession and 5.939 in the most dominant (Table 5). The predominance of dominant alleles was found for leaf width with an r correlation value (and) of -0.104 (Table 5). The UFPB001 and UFPB390 parents had the highest values of 0.102 and 0.103, respectively (Table 5, Figure 3b). Considering the selection limit for this trait, the most dominant accession was 1.978 and the most recessive accessions were 1.231. The parents closest to the base of the regression line have a higher number of dominant genes, and these genes contribute to the increase in this trait (Figure 3b). For the correlation r (and) value, dominant alleles prevailed for chlorophyll a (-0.039), whereas recessive alleles contributed to the increase in chlorophyll b content (0.383). The parents UFPB390 and UFPB77.3 showed the highest values for chlorophyll a (13.104 and 12.794) and for chlorophyll b (5.069 and 9.155) (Table 5, Figures 3c and 3d). The selection limit for chlorophyll a was 31.602 for the most dominant parents. For chlorophyll b, the selection limit for the most recessive parents was 13.144 (Table 5). Estimates of genetic variation components due to the additive gene effects (D) and due to dominance effects (H1 and H2 ) were significant (p<0.05) for the seedling height trait, whereas cotyledonary leaf length and width exhibited no significance for these parameters (Table 6). The mean degree of dominance for seedling height, which is estimated by √H1/D, was equal to 1.189. This trait also had a broad sense heritability of 0.937 and a strict sense of 0.239 (Table 6). For the cotyledonary leaf length and width, mean degrees of dominance of 2.030 and 3.305 were observed, respectively (Table 6). Cotyledonary leaf width exhibited a high broad sense heritability (0.939) and low narrow sense heritability value (0.293), whereas the value for cotyledonary leaf length was low for both broad and narrow sense heritability (0.427) and (0.196). ns not significant and * significant (values higher than 1.96) at 5% probability. cm (centimeter). Table 6: Estimates of genetic variation of parameters due to additive gene effects (D) due to dominance (H1, H2 and h2), the effect of the covariance between the additive and non-additive effects (F) and environmental effects (E) of the diallel for seedling traits in ornamental pepper (Capsicum annuum L.) CCA-UFPB. The genetic variation components for plant traits due to additive genetic effects (D) and dominance (H1 and H2 ) were significant (p<0.01) for canopy width, chlorophyll a and b, plant height and first bifurcation height (p<0.05) (Table 7). The covariance effect between the additive and non-additive (F) effects were significant (p<0.01) for the crown diameter and chlorophyll b. The traits plant height, first fork height and canopy width were also significant (p<0.05) (Table 7). The D - H1 estimate exhibited significant positive values for plant height, first bifurcation height, canopy width, leaf length, leaf width and chlorophyll a (Table 7). PH - Plant Height; Std - Stem Diameter; FBH - First Bifurcation Height; CW - Canopy Width; LL - Leaf Length; LW - Leaf Width; CLA - Chlorophyll A; CLB - Chlorophyll B. Ns Non-Significant And ** And * Significant At 1% And 5% Probability, Respectively. cm (Centimeters). Table 7: Estimates of genetic variation of parameters due to additive genetic effects (D) due to dominance (H1, H2 and h2), the effect of the covariance between additive and non-additive effects (F) and environmental effects (E) of the diallel for eight plant traits in ornamental pepper (Capsicum annuum L.) CCA-UFPB. The dominance effect expressed by the h2 statistic was significant (p<0.05) for plant height and first fork height. For plant height, the broad sense heritability value was 0.775, and the narrow sense value was 0.727. For the first fork height, heritability values in the broad and narrow sense were 0.735 and 0.629, respectively (Table 7). Heritability values greater than 70% in the broad and strict sense were found for the traits crown diameter (0.917 and 0.742), leaf length (0.775 and 0.727) and leaf width (0.856 and 0.805) (Table 7). The plant traits exhibited partial dominance, as the estimates for √H1/D ranged from 0.458 to 0.995 (Table 7). High heritability in both the broad and narrow sense was noted for plant height, first fork height, canopy width and leaf length and width (Table 7). For the stem diameter, negative heritability values were noted in both the broad and narrow senses. For the chlorophyll a and b traits, the heritability values were 0.735 and 0.721 for the broad sense and 0.629 and 0.519 for the strict sense, respectively (Table 7). The significance observed in the treatments for the evaluated traits indicate the existence of genetic variability between genotypes. Promising genotypes can therefore be selected for use in breeding programs based on the evaluated traits (Ferrão et al., 2011; Medeiros et al., 2014). The differences observed in the CV (coefficient of variation) between traits did not preclude confirmation of variability between genotypes. Results similar to those obtained in this work were obtained by Rêgo et al. (2010) in a study of diversity among strains of ornamental pepper with variations in CV value for the evaluated traits and confirmation of diversity among genotypes. In their work with peppers, Silva et al. (2011) determined that the CV values varied according to the trait under study, the accession and the species studied. In this work, the CV values identified for the analyzed traits did not affect experimental accuracy. High and vigorous peppermint saplings are indicated for planting, which present higher performance and vigor (Pessoa et al., 2018). The average values found for the characteristics of plants are indicated for selection and for study of ornamental pepper improvement. Pessoa et al. (2018) indicated for selection genotypes that presented characteristics with mean values similar to that found in this work. Smaller plants are indicated for cultivation in pots (Barroso et al., 2012), while larger plants can be grown outdoors and in gardens (Rêgo and Rêgo, 2018). In the genetic parameters estimate, the positive r correlation (and) for most of the evaluated traits indicates that the recessive alleles were generally responsible for the increase in these traits. Once these traits are determined, it is possible to obtain strains by selecting segregating populations. Andrade et al. (2015) reported the existence of a positive and negative r correlation for traits evaluated in eggplant (Solanum gilo Raddi) and identified that many recessive and dominant alleles act to increase the traits. The allele providing an increase in the mean genotype of a particular trait may be dominant or recessive (Cardoso et al., 2015). When an allele conditions an increase in a trait of interest, this allele can be used in breeding programs. The accessions UFPB134, UFPB137 and UFPB390 are indicated for selection, as they have the highest recessive homozygous values with mean values close to the selection limits for the seedling height trait. Dominant alleles are responsible for the increase in the cotyledonary leaf length and width traits, exhibiting negative r correlation values ( ) and ( ). Of the studied accessions, UFPB001, UFPB134, UFPB137 and UFPB390 exhibited values greater than the selection limit, indicating that these parents are probably already at full homozygosity regarding the genes that control these traits. Genotypic variation components provide greater contribution to the expression of seedling height due to the significance of the additive genetic parameters (D) and the dominance effects (H1 and H2 ). Given the estimates of these components, there are possibilities of additive and non-additive genetic effects in the control of this trait. Iftekharuddaula et al. (2008) reported that significant additive genetic parameters and dominance for the traits indicates that additive effects are equally important in the inheritance of the characters. In the cotyledonary leaf length trait, a greater influence of environmental components was noted, indicating that this trait is more affected by environmental effects. Regarding cotyledon leaf width, genetic parameters could not be indicated, due to lack of significance. Knowledge in regard to the nature of genetic origin and environmental variations is essential for breeding activities, as improving certain agronomic traits depends on basic knowledge about the inheritance of traits, the genetic variability available for improvement and estimates of genetic parameters (Dias et al., 2011). For seedling height and cotyledon leaf length, a value for mean degree of dominance greater than one indicates the existence of overdominance among alleles operating in the genetic control of these traits. In this type of interaction, the selection of superior individuals is not the best strategy for adoption in plant breeding programs, as the mean of generation F1 differs from the mean of the parentals and generation F2 (Ferreira, 2006; Santos et al., 2011). In this case, hybrid production is recommended (Gonçalves et al., 2011). High broad sense heritability values for seedling height (0.937) and hypocotyl diameter (0.842) indicate that most of the phenotypic variation observed for these traits is genetic in nature and the possibility of genetic gains is increased. According to Ramalho et al. (2012), broad sense heritability considers all genetic variance. The higher the broad sense heritability value is, the lower the influence of the environment on the expression of the trait (Fekadu et al., 2003) given that environmental influence hinders the efficient selection of genotypes. Recessive alleles are mostly responsible for the increase in plant height, stem diameter, first bifurcation height, canopy width, leaf length and chlorophyll b, as demonstrated by the positive correction of r. The negative r values for leaf width and chlorophyll a indicate that dominant alleles act to increase these traits. For plant height and crown diameter, the accession UFPB77.3 exhibited the maximum homozygosis expected for these traits with a value equal to the expected selection limit. This finding indicates that there is no possibility of increasing plant height in future generations. Regarding stem diameter and first fork time traits, recessive genes increase the expression of these traits, which indicates the possibility of obtaining superior strains in segregating populations derived from the diallel. For the traits leaf length (UFPB134, UFPB001, UFPB004 and UFPB099), leaf width (UFPB001, UFPB004 and UFPB099), chlorophyll a (UFPB134, UFPB137 and UFPB77.3) and chlorophyll b (UFPB77.3), parents having values greater than the selection limit indicates that these parents are likely already in homozygosity, suggesting ease of improvement in the case of these traits. The results of this experiment differ from those found by Fortunato et al. (2015), who observed negative r correlations for plant height, crown diameter and leaf length in C. annuum. Their results indicate that the dominant alleles are primarily responsible for the increase in these traits likely because other parents were used in obtaining the hybrids with the possibility of obtaining offspring with higher values for these traits. The parents UFPB001, UFPB004 and UFPB134 are the most indicated for selection because they have the lowest first fork height and canopy width ( ) values. In terms of these traits, genotypes with a lower mean are sought because short plants are desirable for potted ornamental peppers. Rêgo and Rêgo (2016) reported a growing demand for new varieties of ornamental peppers that are small in size and have traits of ornamental interest. Additive and non-additive effects controlled the traits plant height, first bifurcation height, canopy width and chlorophyll a and b due to the significance of the genetic parameters. These results are consistent with those found by Nascimento et al. (2011), who observed additive and non-additive effects when controlling these same traits in ornamental pepper. When evaluating general and specific combining ability in C. baccatum for plant height, canopy width and first bifurcation height, Rêgo et al. (2009) found that non-additive effects were more important in controlling these traits. When there is a predominance of additive and non-additive effects in the control of traits, it is recommended that strains are selected from segregating generations and that hybrids are obtained to explore heterosis from the diallel. Additive and non-additive genetic effects may vary between genotypes and species in the control of traits. The mean degree of dominance indicates that the type of allelic interaction involved in the expression of plant height, first bifurcation height and crown diameter is of the partial dominance type. In this type of interaction, the selection of superior individuals does not necessarily lead to the production of descendants similar to the selected individual, and this method does not represent a better strategy to be adopted in a breeding program (Cruz, 2005). Hybrid production is indicated in such cases. High broad and strict sense heritability values greater than 70% observed for plant height, first fork height, crown diameter, leaf length and leaf width suggest the possibility of obtaining genetic gains through selection based on these traits in segregating generations. High heritability for these ornamental pepper traits have also been found by other authors (Neto et al., 2014; Santos et al., 2014; Fortunato et al., 2015; Pessoa et al., 2015.) This magnitude of heritability values indicates that the traits experience minimal environmental influence. The significance of E and non-significance of genetic parameters for the stem diameter trait reveals that the environment has a strong influence on phenotypic expression, which is also reflected in the null heritability values. In a study of the inheritance and genetic parameters in C. annuum, Fortunato et al. (2015) also found no significant value for that trait, and genetic information was not interpreted because this trait undergoes environmental influences in regard to phenotype expression. The analysis and interpretation of genetic information are recommended, and the mean degree of dominance, distribution of alleles among parents, theoretical selection limit, relationship between favorable alleles and dominance, number of dominant genes, proportion between dominant and recessive genes and coefficient of genotypic determination are all significant (Hayman et al., 1954a). Regarding leaf width and length traits, the significant values of D, which were confirmed by the significant positive value of D - H1, indicate that additive genetic effects are involved in the control of these traits. In this case, the selection of genotypes in early generations is recommended. This result can be compared by the high broad and strict sense heritability values of greater than 70% for these traits. Fekadu et al. (2003) report that the higher the broad sense heritability value, the lower the environmental influence on expression of the trait. Various authors consider that heritability values greater than 70% are high and transmit desirable alleles to future generations (Silva et al., 2004; Nascimento et al., 2012b; Neto et al., 2014; Pessoa et al., 2015). Allelic interactions of the additive and non-additive type were found for the chlorophyll a and chlorophyll b traits. In this case, it is recommended that lines from advanced generations are selected and hybrids are obtained to explore the heterosis confirmed by the low strict sense heritability values. The UFPB001 and UFPB134 parents are recommended for selection given that they exhibit the lowest mean values for plant height, first bifurcaton height and canopy width; selection based on these traits is efficient because they have increased heritability values in both the broad and strict sense. For leaf length and width, the parents indicated for selection include UFPB77.3, UFPB134, UFPB137 and UFPB390, as they have small leaves. Genetic gains are possible in regard to the traits plant height, first bifurcation height, canopy width, leaf length and width in ornamental peppers. Hybrid production is recommended for seedling and plant traits as an interaction type of over dominance and partial dominance is observed. UFPB001 and UFPB134 parents are indicated for use in crossings when the aim of the program is to obtain pepper plants of a reduced size for cultivation in pots. Andrade TM, Lasmar A, Maluf WR, Gomes LAA, et al., (2015) Gene action associated with heterosis expression in scarlet eggplant (Solanum gilo Raddi.). Revista de la Facultad de Ciencias Agrarias 47: 19 - 31. Baldissera JNC, Valentini G, Coan MMD, Guidolin AF, et al., (2014) Fatores genéticos relacionados com a herança em populações de plantas autógamas. Revista de Ciências Agroveterinárias 13: 181 - 189. Bosland PW, Votava EJ (1999) Peppers: vegetable and spice Capsicums. Wallingford: CAB International 204 p.
Carvalho SIC, Bianchetti LB, Ribeiro CSC, Lopes CA (2006) Pimentas do gênero Capsicum no Brasil. Brasília: Embrapa Hortaliças. 27p. Cruz CD (2005) Princípios da Genética Quantitativa Viçosa: UFV. 394. Cruz CD (2013) Programa genes (versão Windows): SHicativo computacional em genética e estatística. Editora UFV (Universidade Federal de Viçosa), Viçosa. Cruz CD, Regazzi AJ, Carneiro PCS (2012) Modelos biométricos aplicados ao melhoramento genético. 1. Viçosa: UFV 514. Fekadu M, Ravishankar H, Lemma D (2003) Study on variability in tomato germplasm under conditions of central Ethiopia. Vegetable Crops Research Bulletin 58: 41 - 50. Ferreira PV (2006) Melhoramento de plantas. Maceió-AL, Universidade Federal de Alagoas 615. Finger FL, Rêgo ER, Segatto FB, Nascimento NFF, et al., (2012) Produção e potencial de mercado para pimenta ornamental. Informe Agropecuário. 33: 14 - 20. Hayman BI (1954a) The theory and analysis of diallel crosses. Genetics 39:789 - 809. IPGRI (1995) Descriptores para Capsicum (Capsicum spp). Roma: IPGRI 51. Nascimento MF, Nascimento NFF, Rêgo ER, Sapucay MJLC, et al., (2011) Heterose em cruzamentos dialélicos para qualidade de frutos em pimenteiras ornamentais. Horticultura Brasileira 29: 2948 - 2955. Nascimento WM, Dias DCFS, Freitas RA (2006) Produção de sementes de pimentas Informe Agropecuário 27: 16 - 29. Ramalho MAP, Abreu AFB, Santos JB, Nunes JAR (2012) Aplicações da Genética Quantitativa no Melhoramento de Plantas Autógamas. UFLA 522. Rêgo ER, Rêgo MM (2018) Ornamental pepper. In: Van Huylenbroeck, J. Ornamental crops. Springer International Publishing Switzerland, (in press).